The Baptism of Christ, by Piero della Francesca, 1449. Here, John the Baptist is seen pouring water over Jesus' head. John the Baptist (first century C.E.) was a Jewish Nazirite regarded by Christians as being a prophet and forerunner of Jesus Christ. The New Testament describes John as a preacher who baptized his followers in the waters of the Jordan River. Most famously, it is said that he baptized Jesus of Nazareth thereby (according to Christian accounts) fulfilling the biblical prophecy that Elijah would "come first" to usher in the arrival of the Messiah (Malachi 3:1). The Christian gospels equate John the Baptist with Elijah himself (Matt. 17:12-13). However, the scriptures also suggest a counter-narrative in which John did not fully recognize Jesus' authority. Instead, John continued to lead his own separate following. Several New Testament passages indicate there was some distance between John's followers and the early Christians (John 3:25-26; Luke 5:33; Acts 18:24). In the year 31 C.E. or early 32 C.E., John was beheaded at the command of Herod, at the request of Herodias. The community of John the Baptist became known as Mandeans, and they continue to exist to this day. 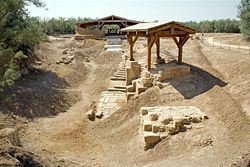 The excavated remains of the baptism site in "Bethany beyond the Jordan". According to Luke, John was born about six months before Jesus, and that Zechariah’s disbelief over the birth of his son rendered him mute, which was restored on the occasion of John's circumcision (Luke 1:64). Luke implies that John was a Nazirite/Nazarite from his birth (Luke 1:15)—refraining from wine and other strong drink—and the synoptics agree that he spent his early years in the mountainous tract of Judea, in the wilderness between Jerusalem and the Dead Sea (Matt. 3:1-12). The Gospels add that he led a simple life, clothed only with camel's hair and a leather girdle around his loins, and eating little more than just locusts and wild honey (Matt. 3:4). The early church fathers John Chrysostom (347-407 C.E.) and Saint Jerome (c. 347-120 C.E.) believed that John had been brought up from his infancy in this manner, as Matthew 11:18 describes. According to the Gospel of John, when John the Baptist was thirty years of age, in the fifteenth year of Tiberius (28 C.E. ), John began his ministry by proclaiming the coming of the Messiah, preaching repentance, and the turning away from selfish pursuits. The synoptic gospels make no such claim, but agree with the Gospel of John that John the Baptist gathered a large following, and induced many persons to confess their sins, and whom he then baptized in the River Jordan. It is also said that John the Baptist denounced the Sadducees and Pharisees as a "generation of vipers," and warned them not to assume their heritage gave them special privilege (Luke 3:8). He warned tax collectors and soldiers against extortion and plunder. His doctrine and manner of life stirred interest, bringing people from all parts to see him on the banks of the Jordan. There he baptized thousands whom repented. One of those whom John baptized is reportedly Jesus of Nazareth. According to the Gospel of John (but not the Synoptic Gospels), John initially excused himself from this action by saying, "I need rather being baptized by you," but Jesus declared that it became them to fulfill all righteousness, and John complied. The Gospel of John states that the next day John publicly announced Jesus as the Lamb of God, who “takes away the sins of the world” (John 1:19-29), and that John's office as forerunner ended with the baptism of Jesus, though he continued for a while to bear testimony to the messiahship of Jesus. The other three Gospels state that John baptized Jesus shortly after Jesus presented himself, and they make no indication that John's ministry had ended, even making further references, later in the text, to John the Baptist continuing to have followers that were independent to those of Jesus. John is traditionally honored on account of his testimony, especially at the initial baptism. Yet evidence points to only half-hearted support for Jesus. There is no record that John ever cooperated with Jesus. They seem to have founded rival groups. Quarrels broke out between John's disciples and Jesus' disciples (John 3:25-26), and while John obliquely praised his greatness, he kept his distance: "He must increase, but I must decrease." (John 3:30). John went his own way and ended up in prison, where, according to Matthew's gospel, he voiced doubts about Jesus: "Are you he who is to come, or shall we look for another?" (Matt. 11:3) Jesus answered in disappointment, "Blessed is he who takes no offense at me." (Matt. 11:6) The Baptist movement remained a separate sect, continuing on after John's death. A small population of Mandaeans exists to this day; they regard Jesus as an impostor and opponent of the good prophet John the Baptist—whom they nonetheless believe to have baptized him. According to Matthew's account, Jesus had assigned a role to John, that of Elijah the prophet, whose return Jews believed was to presage the Messiah. (Matt. 11:14) The absence of Elijah was an obstacle to belief in Jesus. (Matt. 17:10-13) John the Baptist was highly thought of by the Jewish leadership of his day. It must have disappointed Jesus greatly when John did not accept that role—he even denied it (John 1:21)—because it made his acceptance by the religious leaders of his day that much more difficult. The beheading of John the Baptist, by Jacopo da Ponte. John the Baptist's public ministry was suddenly brought to a close—after about six months—when he was cast into prison by Herod Antipas (not to be confused with Herod the Great), whom he had reproved for taking his brother Philip's wife Herodias (Luke 3:19). Herod had married Herodias contrary to the Mosaic Law and John vehemently protested this, which led to his arrest. Even though Herod wanted to kill John, he was afraid of the many people who regarded John as a prophet. When Herod made an oath in the presence of his guests to reward Heorodias' daughter for the excellence of her dancing before the crowd, it provided an excuse to murder John. Herod promised to grant Heorodias' daughter whatever she might ask. Herod complied for under the Law he was bound by his oath. John was imprisoned in the Machaerus fortress on the southern extremity of Peraea, nine miles east of the Dead Sea. Here he was beheaded around 31 C.E. or early 32 C.E. His disciples, after consigning his headless body to the grave, told Jesus all that had occurred (Matt. 14:3-12). John's death apparently came just before the third Passover of Jesus' ministry. The Gospels do not say where John was buried. In the time of Julian the Apostate, however, his tomb was shown at Samaria, where the inhabitants opened it and burned part of his bones. Some Christians, who carried them to an abbot of Jerusalem named Philip, saved the rest. Shi’a Muslim tradition maintains that the head of John the Baptist is interred in the Umayyad Mosque in Damascus, Syria. In later times, it was said that the Knights Templar also had possession of the head of St. John. The gospel of John has evidence that John and Jesus had parallel and rival ministries (John 3:22-4:3). Acts 18:24-19:7 recounts the conversion of a Jew named Apollos, who "knew only the baptism of John" (Acts 18:25). This may be evidence that the John the Baptist movement continued after his death. Given John's higher social status in Jewish society, it is not surprising that some Jews regarded Jesus as no more than a dissident disciple of John. (Thus some Jews thought Jesus to be the resurrected John (Mark 6:14-16; Matt. 14:2). A common scholarly view is that the Jesus movement grew out of a larger John the Baptist Movement. Jesus' movement was the smaller, and the gospels' frequent praise of John can be explained by the early Christian efforts to recruit followers of the Baptist, like Apollos. Indeed, the primary critical viewpoint on Jesus and John the Baptist is that the gospels attempted to Christianize the Baptist or make John declare Jesus' superiority to him. The primary vehicle for this is the unverifiable story of Jesus' baptism. Thus in Mark 1:9-11, the revelation at the Jordan was for Jesus only; John did not see it. John does not testify to Jesus in Luke's account of the baptism, possibly because the fact that John had not testified to Jesus was too well known in the circles around Luke to be contradicted. (Instead, it is Luke's mother Elizabeth who gives testimony in Luke 1:41-45). In Luke, John only hears stories of Jesus' miracles when he is in prison. The gospels of Matthew and John seem to take the greatest pains to have John the Baptist accede to Jesus' superiority at the baptism scene. John and his movement remained outside the Kingdom of Christ. When Jesus addressed a delegation of John's followers in the context of his doubts, he says, "He who is least in the Kingdom of Heaven is greater than he [John]" (Matt. 11:11). A fair assessment, according to D. F. Strauss, was that John the Baptist "detained a circle of individuals on the borders of the Messiah's kingdom, and retarded or hindered their going over to Jesus." John's Baptism is not for the repentance of sins, as opposed to Mark 1:4. John is executed to prevent "mischief," rather than to please Herod's wife's daughter. Jesus is not mentioned in relation to the Baptist. Josephus's passage is quoted by Origen in Contra Celsum in the early third century, and again by Eusebius of Caesarea in the fourth century. The book of Malachi is the last book of the Old Testament canon and the last book of the Neviim (prophets) section in the Jewish editions. Malachi 3:1 reads: "Behold, I will send my messenger, and he shall prepare the way before me: and the Lord, whom ye seek, shall suddenly come to his temple, even the messenger of the covenant, whom ye delight in: behold, he shall come, saith the Lord of hosts." Most Jews, whether in the times after Malachi or in modern times, look for a messenger to prepare the way of the Lord immediately before his coming. The long succession of prophets finds its ending in Malachi, and the concluding words of the book of Malachi, subjoined with an admonition to remember the law of Moses, import that the next prophet would be that "messenger" or forerunner of the Messiah. Malachi identifies him with Elijah. John, who lived in the wilderness clothed in a garment of camel's hair, may have consciously regarded himself as following in the footsteps of Elijah of old. It is also possible that one reason for the fervor surrounding the John the Baptist movement was that many Jews saw him as the fulfillment of that prophecy. A voice cries out in the wilderness: Prepare ye the way of the Lord, make straight in the desert a highway for our God. Every valley shall be exalted, and every mountain and hill shall be made low: and the crooked shall be made straight, and the rough places plain. And the glory of the Lord shall be revealed, and all flesh shall see it together: for the mouth of the Lord hath spoken it. This passage is cited in Matthew 3:3, either as a Christian explanation of John's work in the wilderness or a recollection of John's own preaching as he prepared the way for the Messiah to come. The followers of John the Baptist later became organized as an independent sect, now known as the Mandaeans. Today, the Mandeans believe John the Baptist, called Yahya in the Sidra d-Yahia (Book of John), was the last and greatest of the prophets. 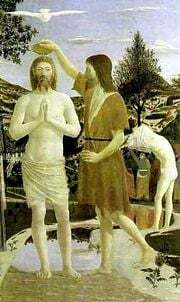 While Mandaeans agree that he baptized Jesus (Yeshu), they reject the latter as either a savior or prophet, viewing John as the only true Messiah. According to the text of the Ginza Rabba, John died at the hand of an angel. The angel appeared as a three-year-old child, coming to John for baptism. John knew the angel for what it was, and that once he touched its hand, he would die immediately. John performed the baptism anyway, and died in the process. Afterwards, the angel covered John's body with mud. 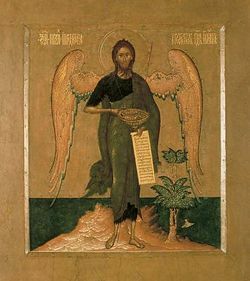 Eastern Orthodox icon John the Baptist - the Angel of Desert (1620s). The Eastern Orthodox teach that John was the last of the Old Testament prophets, thus serving as a bridge figure between that period of revelation and Jesus. They also embrace a tradition that, following his death, John descended into Hell and there once more preached that Jesus the Messiah was coming. September 23 - Zechariah and Elisabeth, parents of St John, the Lord's Precursor, are commemorated on this day; the Eastern Church (see above) also celebrates his conception. Saint John the Baptist is the patron saint of French Canada. The Canadian cities of Saint John, New Brunswick, and St. John's, Newfoundland were both named in honor of Saint John. His feast day is June 24, celebrated in Quebec as the Fête nationale du Québec. He is also counted as the Patron of the Knights Hospitaller of Jerusalem. Latter-day Saints believe that John the Baptist appeared in Pennsylvania, as a resurrected being, to Joseph Smith Jr. and Oliver Cowdery on May 15, 1829, and gave them the Aaronic Priesthood. They also believe that John's ministry was foretold by two prophets in the Book of Mormon: Lehi (1 Nephi 10:7-10) and his son, Nephi (1 Nephi 11:27; 2 Nephi 31:4-18). ↑ Walter Wink, John the Baptist in the Gospel Tradition (Cambridge University Press, 1968), 81. ↑ David Strauss, The Life of Jesus Critically Examined (reprint, Philadelphia: Fortress Press, 1972), 226-27. History of "John the Baptist"
This page was last modified on 24 May 2018, at 15:14.